WALNUT -- Mt. SAC is no easy course. And although it is officially 2.93-miles of asphalt, grass, dirt, switchbacks, dusty trails and mountain climbs, it is sorted in the same 3-mile rankings pool as the speedway also known as Woodbridge. 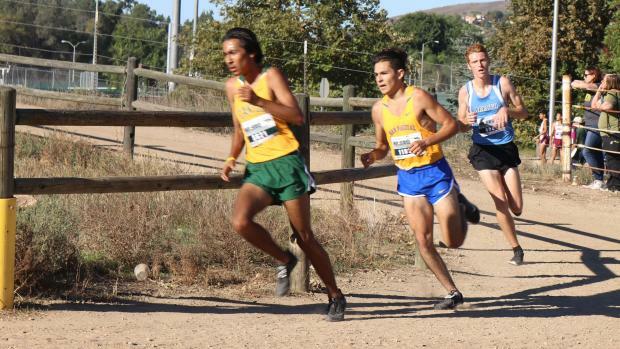 For perspective, times from the mid-September Woodbridge Invitational, held at the SilverLakes Sports Complex in Norco, account for the top five and nine of the top 11 among boys, and 11 of the top 12 among girls. No, that's not the California rankings leaders for 3 miles. That's in the U.S.!!! So, while "3-mile" times from Mt. SAC really have no business in the same category as those from Woodbridge, a "Gold Standard" result from this past weekend's challenge is noteworthy. "Gold Standard" is any mark warranting "U.S. First Team" recognition across the MileSplit network. Mt. SAC produced a hearty share of "Gold Standard" performances. At the very top were those by La Costa Canyon senior Kristin Fahy and Rubidoux senior Kevin Ramos. Fahy got the best of a deep field in the D1/D2 Team Sweepstakes and Ramos was the best of the lads in the D1/D2 Individual Sweepstakes race. Both were running in the morning before 10 a.m., and before it got truly hot, when temperatures peaked in the high 80s on a sunny and dry Saturday at Mt. San Antonio College in Walnut. Fahy made a statement with a winning 16:50.00 and handing stellar Great Oak junior Tori Gaitan her first invitational defeat of the season. Gaitan, who has invitational titles this season from Woodbridge, Bob Firman and Clovis, was 12 seconds back of Fahy, and also led the charge as the juggernaut Wolfpack girls won the meet's overall title for the fifth year in a row (as did Great Oak's boys!). Ramos flirted with course-record pace at times before falling a mere five seconds short, finishing in a nonetheless impressive 14:28. 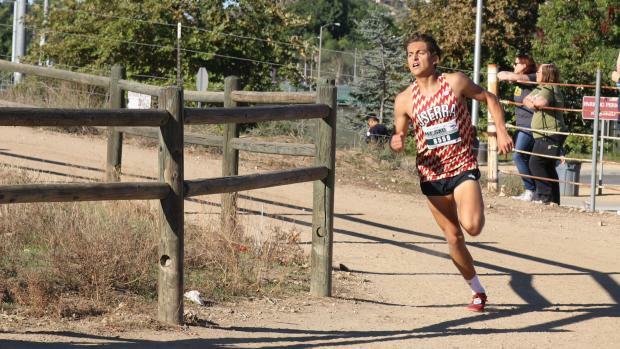 He left the likes of JSerra's Anthony Grover (15:01), Canyon Country Canyon's Ethan Danforth (15:01.00), JSerra's Peter Herold (15:02) and San Pasqual's Franky Varela (15:03) well back in a chase for runner-up medals. Outstanding De La Salle senior Connor Livingston undoubtedly would have been in that mix if not for an early fall that left him with a couple of patches of the Mt. SAC course embedded uncomfortably in a couple spots on his body. Despite that, Livingston managed a 15:18 for ninth place. Eight of the 10 CIF sections got Gold Standard representation over the weekend, as did runners from Texas and Alaska. Texan Crayton Carrozza blistered the final 400 meters to take the Boys D1/D2 Team Sweepstakes title from Great Oak senior Tyler Tickner, running 14:35, the second-fastest time of the meet. Tickner's 14:44 was third fastest overall. Alaskan Ava Earl's 17:47 ranked 13th overall among girls in the two-day meet. She ran Friday in the D4/D5 Sweepstakes race, one of the marquee races on Friday. 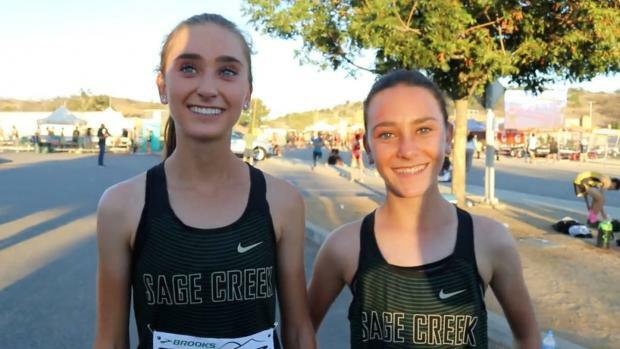 Sage Creek junior Skyler Wallace blistered a Friday-best time of 17:19.00 (No. 3 overall in merged results) with Harvard Westlake's Daniela Quintero a distant second in 17:44 at the top of that race. Wallace's freshman sister, Stormy Wallace, was fourth in 17:48 with Quintero's sister Natalia fifth in 17:50. Earl, a sophomore from South Anchorage who was fourth in the Alaska D1 State Finals (held Sept. 29), evenly spit the Wallace and Quintero sisters. Walnut senior Chloe Arriaga, a two-time CIF-Southern Section Divisional champion who was second last year, ran third to Fahy and Gaitan in the team sweepstakes race, crossing in 17:21. Afterward Arriaga announced that she and her sister Emma had committed to UC Davis. On the course, Emma was only steps behind her sis, crossing in 17:38, the No. 8 time overall at the meet. Outstanding Oakland Tech senior Caroline Garrett made a statement with her fourth-place finish in the Team Sweepstakes race. Her 17:36 was just behind Chloe Arriaga and in front of Great Oak junior Arianna Griffiths (17:37). 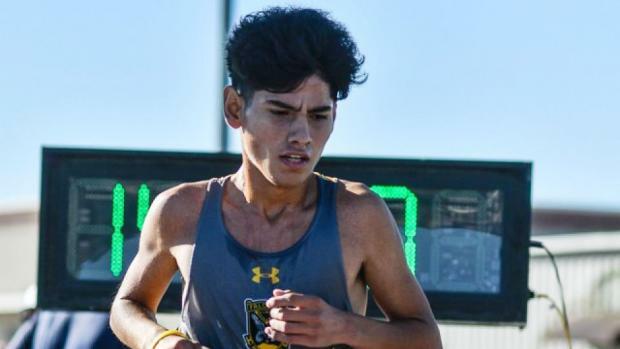 Griffiths joined Gaitan, Fatima Cortes and Audrey Dang from Great Oak with Gold Standard results among the girls, and Wolfpack boys Tickner, Chris Verdugo and Gabe Abbes made the list. No other school had as many. La Costa Canyon was closest with three: Fahy and BYU-bound twins Garrett and Jacob Stanford, who helped push the pace early in the Team Sweepstakes race. There wasn't a senior among the top five in the Girls D1/D2 Individual Sweepstakes race, as sophomores took the top two spots with Amador Valley's Hope Bergmark crossing first (17:35) ahead of Jacqueline Duarte of Chino Hills (17:42). Next came two juniors: Carlie Dorostkar of Canyon Crest Academy (SD) in third (17:43) and Hana Catsimanes of San Clemente (SS) fourth in 18:01. Another San Diegan, Jacey Farmer, a freshman from Rancho Bernardo, was fifth in 18:03. Farmer was one of six in the Class of 2022 to make the Gold Standard list of 25 girls, seven more than made the boys elite lineup. Del Oro's Riley Chamberlain led the class with a 17:42 clocking on Friday in a race contested just after noon. 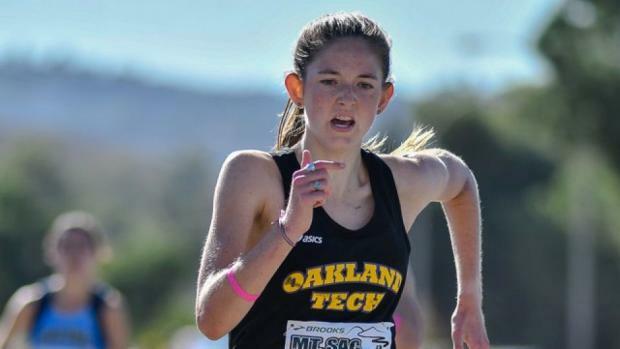 Chamberlain, who was a close second to Gaitan and beat defending state Division 1 champion Corie Smith recently at the Clovis Invitational, passed on Saturday's invitationals so she could run with her team on Friday. Plus, the group from NorCal also had Disneyland and the beach on their SoCal to-do list, she said. 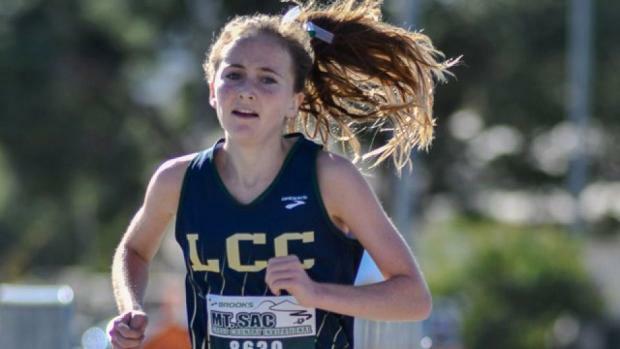 The other freshman girls to run Gold Standard times: the aforementioned Stormy Wallace, Anaheim Hills Canyon's Emma Hadley (17:55), Sofia Abrego of Granada Hills Charter in the LA City Section (17:57), and Mira Costa's Dalia Frias (18:02). La Costa Canyon's aforementioned Stanford twins, with Jacob crossing in 14:57 and Garrett clocked exactly a second later. Just missing the sub-15 club was Russell Sullivan of Foothill Pleasanton (NC) and Great Oak's Verdugo, who both hit the Finished Results purple carpet finish line at 15-flat! 42 performances met the MileSplit US First Team standard.